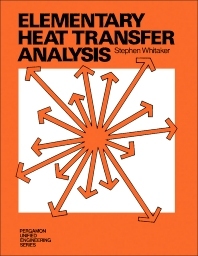 Elementary Heat Transfer Analysis provides information pertinent to the fundamental aspects of the nature of transient heat conduction. This book presents a thorough understanding of the thermal energy equation and its application to boundary layer flows and confined and unconfined turbulent flows. Organized into nine chapters, this book begins with an overview of the use of heat transfer coefficients in formulating the flux condition at phase interface. This text then explains the specification as well as application of flux boundary conditions. Other chapters consider a derivation of the transient heat conduction equation. This book discusses as well the convective energy transport based on the understanding and application of the thermal energy equation. The final chapter deals with the study of the processes of heat transfer during boiling and condensation. This book is a valuable resource for Junior or Senior engineering students who are in an introductory course in heat transfer.